When the day comes to take the dog into the stock (only take this step if you are confident that you have him under control) just drop the rope and let him drag it. That way if things get out of control, you can easily step on the rope to stop him. You never know what can happen the first time in, as dogs can really differ. Some might lie there and “stick” — in which case you can walk towards the dog, forcing him to move away from you and hopefully go around the stock. Or, if he doesn’t want to move, you can move the stock yourself creating some action and that might get him motivated and loosened up. On this kind of dog, take the rope off, giving him lots of freedom and no added hindrance. Other dogs will be hotter than a twodollar pistol, and will want to rip and tear, and bite and chase with no respect for you or the livestock. With this kind, you need to get into their heads and let them know that you are in control and will allow them play (work), but they have to play by your rules. Don’t be in a hurry to take the rope off or even drop the rope. Refresh his obedience training close to the stock until he quits arguing about it. When I started training dogs nearly thirty years ago, the trend was to not use a long rope. You would take the dog into the pen of stock, turn him loose and do whatever it took to keep him off the stock. Keep him circling, changing direction, and eventually lie him down. I used to do this too. It usually meant a lot of running, waving, sometimes throwing a stick, hollering and quite often a few bad words. 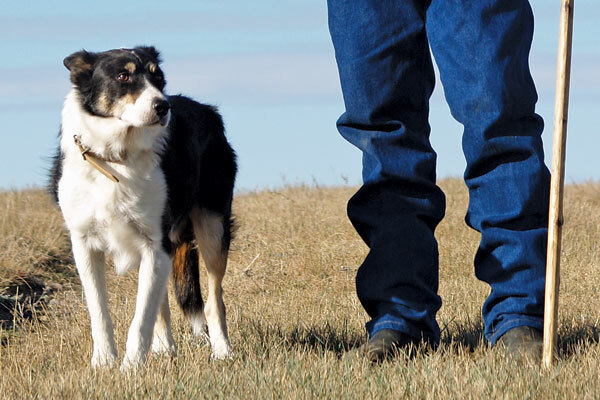 If you get in a foot race or endurance test with a keen Border Collie — unless your timing and positioning is perfect — I guarantee you are going to lose. I can honestly say that nowadays I hardly ever get off a slow walk. Dog training, like horse training or colt starting, has changed a lot in the last thirty years. At least for me it has. The lessons in obedience on a long rope, introducing the dog to stock, and keeping it under control (as explained in previous issues), helps prepare him for when he is turned loose. Again, I’m not writing this for the experienced dog handler, but for the beginner. 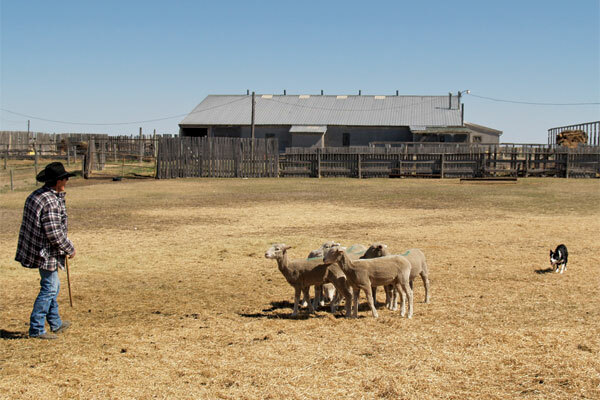 In the early stages of training, the first objective is to get him to go around the stock to the far side. Think of a clock with the stock in the middle, the handler at six o’clock and the dog at 12 o’clock. This is what you are trying to achieve. Don’t try to send him too far. Start fairly close to the stock — say about 50 feet. Lie the dog down, then walk to about halfway between the dog and the stock. Face the dog, keeping in a straight line between the dog and stock. When things are settled down, step to one side so the dog has an open side to run to and ask him to go. Use a “SHHHH” noise along with the “get out” command. Hopefully, the dog will flank off away from you towards the open side and around the stock to the point of balance. If he should run straight at them or try to cut around you to take the long way around, with you being in between the dog and stock, you will be in a position to stop him. Most dogs have a favourite side to go to, just like most horses have a favourite lead. The first few times you might let the dog go to his ‘good’ side just to get him going, but then ask or gently force him to go to his ‘bad’ side. When the dog gets around to the far side of the stock, opposite from you, lie him down. (That would be ideal, but seldom happens the first time out.) You may have to, and probably will have to, step in between the dog and stock to get him stopped. When you get him stopped, hesitate for a few seconds then step to the side and send him again — hopefully in the other direction. If he’s coming in tight or too aggressively as he goes around, walk through the stock and push him out using your body pressure and a gruff “get out”, a loud “AAAAH” or whatever it takes to make him realize he has to stay out until he hits 12 o’clock. Now start working on and perfecting his balance. As you walk around the stock, make him stay on his side. You can walk in a circle, change direction, walk the other way, back up a few steps, then change direction again, all the time making him balance the stock to you. As the dog changes direction try to make him do a 180° turn — much like a reining horse would turn over his hocks doing a rollback. To achieve this you will probably have to step towards the dog as he is stopping and turning, putting some pressure on him as you say “get out”. You may have to work on this for a while with some dogs, while others turn quite naturally. When he’s going around properly, finding the balance point and stopping, start progressing his training. You can stop him short, say at 2 o’clock or 10 o’clock, step away from the stock and call him to you. Do a lot of starts and stops, making sure you can stop the dog at any point around the 360° circle. When he brings the stock to you, put a “steady” or “take time” command on him. One way to do this is; when the dog is bringing them too fast, walk towards the dog, letting the stock go by you. Get in the dog’s face, putting pressure on him fairly harshly and saying “steady” in a gruff voice. Make him back off from you a little bit, but make sure he doesn’t flank out and get around the stock on you. Another thing you can do when he’s too fast is to give him a “steady” and if you don’t see him slow down then correct him with a “lie down” in a harsh voice. Ask him to “get up” in a softer voice then add a “steady” command. If there is no change of pace, add another harsh “lie down”. Eventually when hearing a “steady”, he will anticipate a “lie down” coming and start to respond to the “steady” command. If you train on your dog 10-15 minutes a day, three or four days a week, and if you are consistent with your commands and corrections, you’ll be surprised at how fast he advances. Remember to do lots of starts and stops. Make sure you can call him off and back to you. You MUST be able to stop the dog. A dog you can’t stop is like riding a horse with no whoa on it. If you can’t stop your horse there’s not much you can do with it other than cover a lot of ground in a short time. 1. You weren’t paying attention to the dog and he got away on you. 2. You couldn’t stop the dog and he got away on you. 3. You don’t have a good enough recall on the dog and he got away and wouldn’t come back. When the dog sees the cows getting away (out the gate) his instincts kick in (like they should). This is when your command has to override his instincts. In the dogs mind, he is doing you a favour; he kept the cows from getting away. In any case, it was your fault. So if you’re looking for somebody to blame and cuss at, have a look in the mirror.